ifbmt stands for Independent Fundamental Baptist Missionary Trails. This project was envisioned by my friends while on deputation throughout the states. To help like faith missionaries with an easy and centralized way to manage their deputation trail. This is based on the Biblical principle of stewardship which can be found in John 16:1-13. Jesus commended the unjust steward because he had done wisely. Keeping accurate records that can be passed down to our children’s children (Pro. 13:22) will honour the Lord. Being faithful is more than just being at the right place at the right time. Faithfulness is also having the knowledge and using that knowledge is wisdom. Decisions of missionaries should be based upon the guidance of the Holy Spirit and the facts that God has given us. The first fact is the King James Bible. God has already told us how to build our ministries and how to have the right kind of relationship with Him. Management decisions should be based upon knowledge. We are told in Psalms 78 that we should know the history of great things God has done, so that we will not forget about the works of God and keep his commandments. In Proverbs 15:28 we are told that the heart of the righteous studieth to answer and then in Colossians 4:6 we are told that our speech should always be with grace, seasoned with salt, that we may know how to answer every man. By using this application, missionaries will have knowledge with which to make accurate decisions, accurate records to testify to the glory of God, and wisdom to give quick and honest answers to every man. 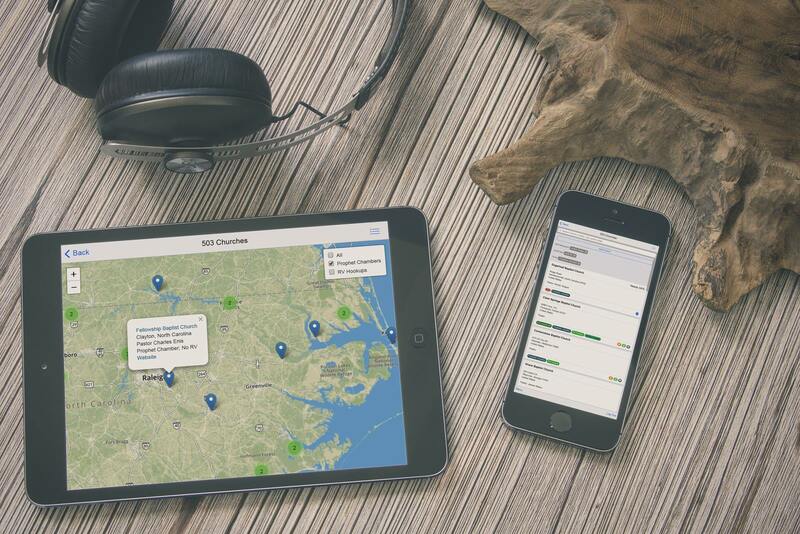 Instant access to contact and location information for over 10,000 churches across the world. Case 1: You are a new missionary that is just starting deputation and are fumbling around with the phone, calendar, notebook, and map all at the same time trying to best use the little time that you actually are able to reach a pastor and schedule a meeting. The pastor on the other end of the phone suggests a date and you are frantically checking your calendar and the map for where you will be directly before and after the meeting to not book yourself in an impossible situation. DROP THE MADNESS! Enter ifbmt! 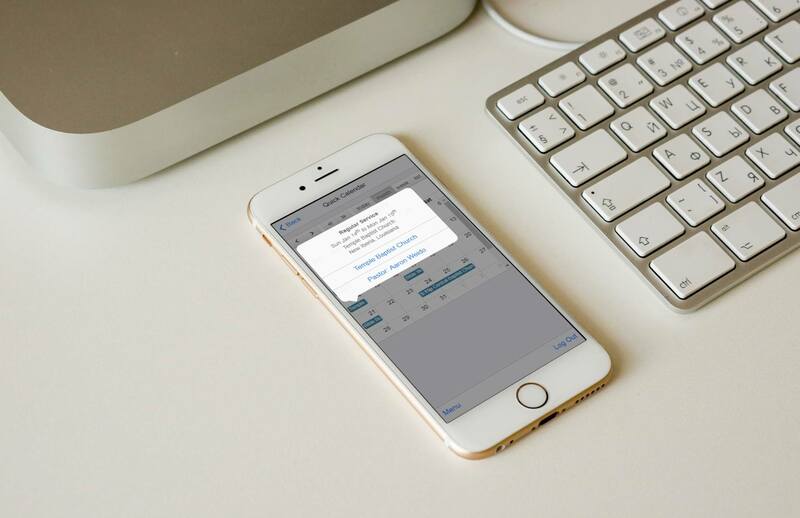 With ifbmt you already have your church loaded that you are on the phone with, you click the link for schedule a meeting and you are presented with your calendar schedule in a monthly, weekly, or agenda view. You then pick a date and are presented with a map view of the surrounding meetings with a prompt to go back or continue. Upon continuing you are presented with a form to quickly enter any notes with a start date and time and an end date and time. The church and contact information is attached already to the meeting. Upon saving the meeting an email is sent to you confirming the meeting and also an email is sent to the pastor (if an email address is on file) confirming the meeting schedule. Case 2: A pastor just called and canceled a meeting. One of the missionaries worst dreaded calls. Many thoughts are pouring through your head with maybe even some discouragement and depression. 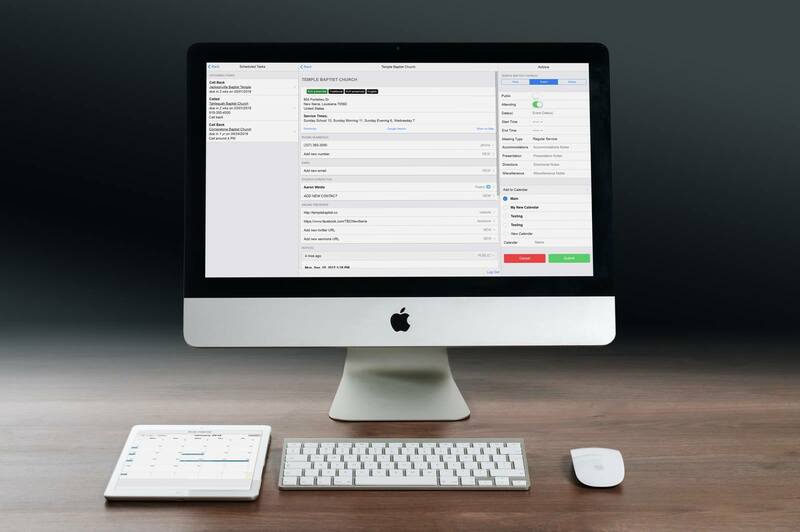 With ifbmt, you can use the knowledge base to search for churches in the geographical location for your surrounding meetings and start calling and sending out emails immediately to fill the empty dates. Case 3: You receive a call back from a pastor whose name you barely remember, you have called literally hundreds in the past two weeks… Instead of frantically searching for notes for who the pastor is and what church he is from you look up the phone number, pastors name, city, or church name and quickly find the contact information and all of your personal notes for the pastor. he informs you of a missions conference or camp meeting and offers you an invitation. You follow the procedure before and set the appointment. After booking the meeting, and are back at the church information screen you quickly add a public note with high priority about the upcoming conference, you set the public flag and add an expiration date. Now all other users on the app can see the alert and try to book at the conference as well. Case 4: You call a pastor and are given the run-around which could involve many different things from not supporting your for having too many children or because you did not graduate from a certain college. You add a low priority note with the broad information, (not a gossip session) and mark the public flag. Now any users who are about to call the pastor will receive some insight that you gleaned to help make themselves better presentable or maybe not even waste their time. Please reference our webiste https://ifbmt.info for our current prices. This project is being developed by Bible believing Fundamental Baptist Church members with current full-time jobs and who are also actively involved in the weekly ministries of their local church. Please be respectful and helpful with input. Development and support will be given as soon as possible.